Games the whole family can enjoy! Add them to a jumper rental, or just rent some games. Either way, your're in for a fun day of play! *$60 minimum for rentals without a jumper. (Minimum is before delivery fee is added.) Pick up of rentals are not permitted. Now it's a SPORT! Fun to play and exciting to watch! 54 Over-Sized Hardwood Blocks. Setup starts at nearly 22 inches high, and can stack to over 4 feet high in play! Blocks are over 8 times the size of original Jenga blocks. Each block is 6"x2"x1.2"
JUMBO Stacking Blocks are the awesome new craze in backyard games! This set includes 48 JUMBO, hardwood pieces for stacking up to over 5 ft. high! Tons of fun for kids and adults alike. Each block is 10.5"x3.5"x 1.5"
All ages can enjoy this Corn Hole Bag Toss game. BAGGO Bag Toss Game takes a backyard classic to a whole new level. Comes with 2 Offifical size boards and 8 bean bags. 4 Blue and 4 Red. Space the game ladders about 15 feet apart and start tossing your bolas. First player tosses all 3 bolas, then the next player tosses all 3 bolas. The first one to 21 points without going over is the winner! The top rung (bar) is worth 3 points, middle is 2 and bottom rung is 1 point. This game is fun and safe as the Bolas are the official game size and weight, only they are plastic. The Mashball Game offers competitive fun for whole family to get involved in an exciting game! This plug pong games includes 1 box, 2 balls, 22 plugs, and 1 measuring cord. 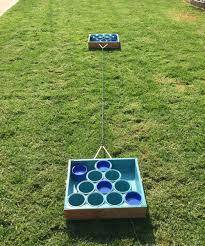 Washer Toss- Comes with two targets and 8 washers. Set up in the grass or sand and start playing this fun and easy game in no time! Great for all ages. 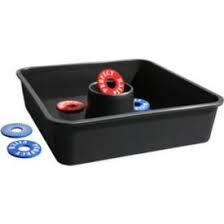 Ring Toss- Keep the little ones entertained with this easy ring toss game. Throw each ring onto the peg for points. Each peg has a printed score, so tracking points is easy. See if you can get all of the frisbees in the bucket! Play side by side (1 v 1) or in teams. This game is tons of fun and makes for a great relay game too! 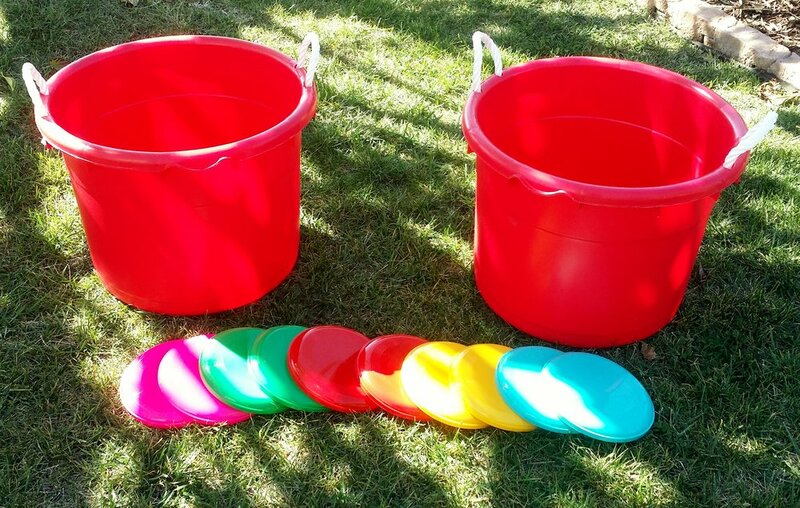 You get 2 large buckets and 8 frisbees.